I have a love-hate relationship with my new home, Toronto. I love the people, the culture and the food. Heck, I even love how every neighborhood has it’s own unique vibe. The hate for this beautiful city comes from the weather. Every year I make an irrational and last minute decision to travel somewhere warm to escape the freezing cold temperatures, especially when that temperature drags into April. 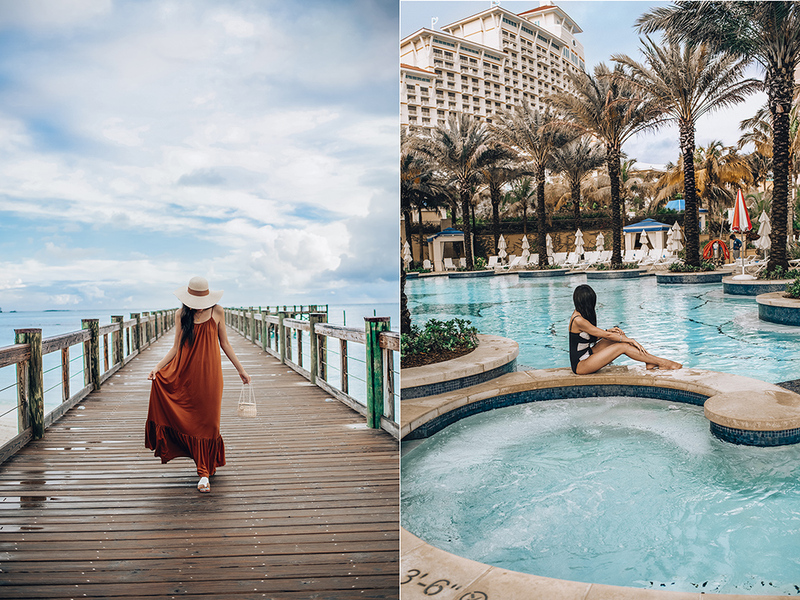 This year, my husband and I went to the Bahamas for some sun and soak in some much needed Vitamin D.
Now when I usually visit a city, I stay in one hotel until I move to the next city. You see I’m one of those crazy travelers who unpacks their whole suitcase and actually uses the cupboards/drawers to store her stuff. 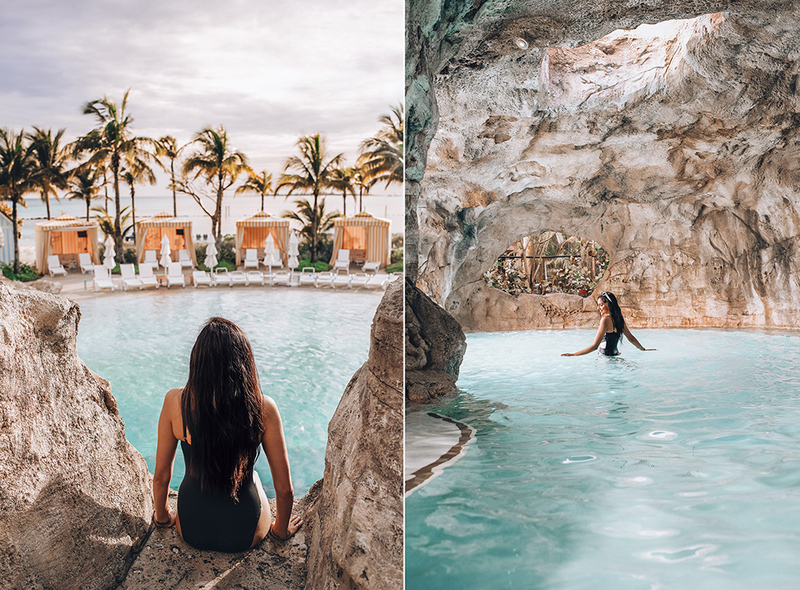 So when it came to trip planning for the Bahamas, we couldn’t decide where we wanted to stay – Grand Hyatt Baha Mar or The Cove in Atlantis. Each of these hotels offered something unique and different – so why not try both. Ever since I can remember, I have always had epic vacations and trips. We plan every detail, from sightseeing, to where to eat, even on finding that perfect souvenir to take back home. After a few trips in my early twenties, I learned how to pack efficiently and create a go-to list to help make sure I grab all my essentials. That being said, I’ve always had trouble making sure I meet the weight restriction on my trip back home. You see most hotels don’t have a weighing scale in their bathroom, so I’ve had 2-3 embarrassing situations where I have had to unpack the excess weight from my suitcase into a separate box at the airport. But it doesn’t stop there, I also have to pay a crazy amount to check in an extra piece of luggage (plus pay for the box they gave me). You think I’d learn after the first time that happened to me, but nah! For this trip, we got a MAJOR upgrade with our luggage and got Heys new Smart Luggage 3 piece set. This set is perfect for the tech savvy traveler and over packer (like yours truly)! It has a built in smart handle with integrated scale so you can find out how much your suitcase weighs with the Heys app. If you are prone to loosing your suitcase keys, no worries. It has Bluetooth smart TSA lock so you can remotely lock or unlock your luggage using your smart phone. Another feature I love, is the proximity alarm that alerts me when my luggage is a distance away. 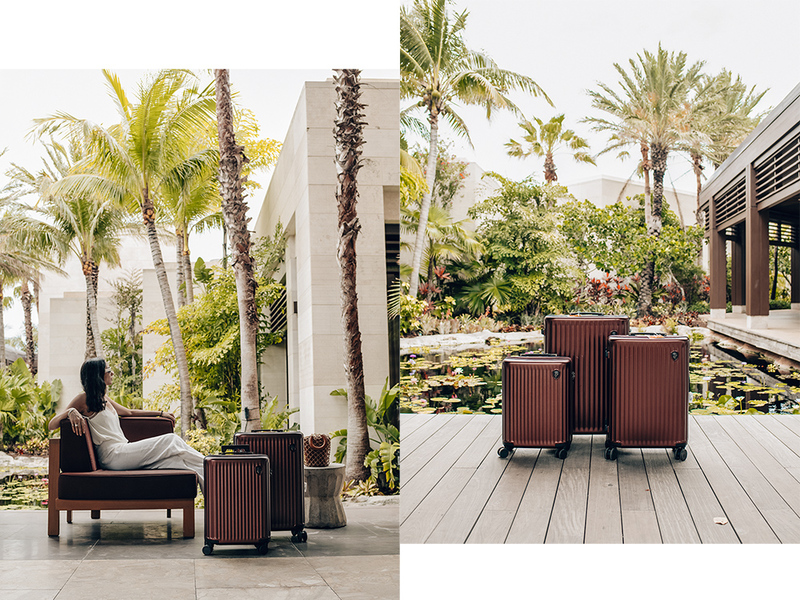 It really is a smart luggage and a great set! Plus with the burgundy colour we picked up, it’s easy to spot when it comes down the conveyor belt. 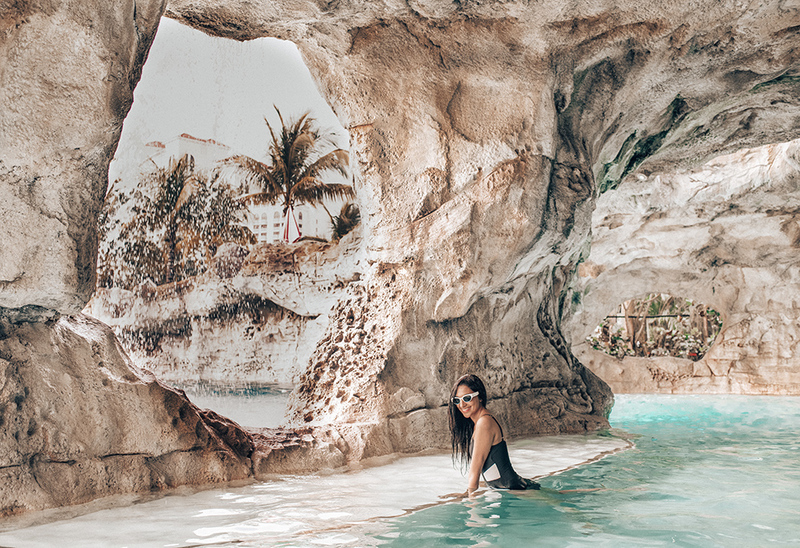 If you are looking for a hotel that offers no activities except sun bathing and frolicking in the pool or beach, the Grand Hyatt Baha Mar is the place for you. This newly developed luxury resort offers six pools (my personal favorite is the dean’s pool), a collection of amazing restaurants, spacious rooms and suites that have breathtaking views of the ocean and island, and multiple spots that can instantly become your favorite reading corner. 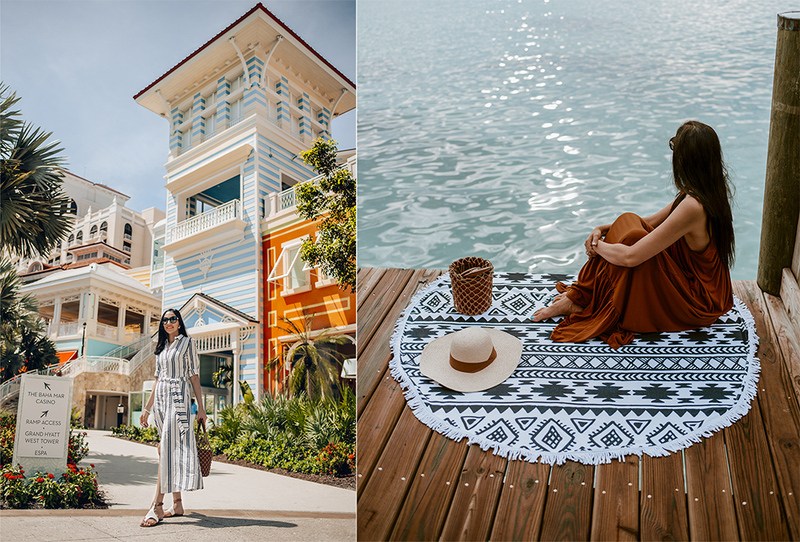 If you are looking for a hotel that is INSTAGRAM heaven at every turn, this hotel delivers it! If you don’t believe me, scroll down and you tell me. Photograph from the Dean’s Pool that makes you feel like you are swimming in a cave. Dare yourself and go cliff jumping into the pool. Take a walk on the pier…or lounge in a hot tub and quickly slip into a pool again. Stroll between the SLS and Grand Hyatt hotel or find a cute spot to just sit and enjoy the view. If hanging around the pool or sun bathing is not your thing and activities is what you crave, head on over to the beach and rent a paddle board or jet ski for some fun. 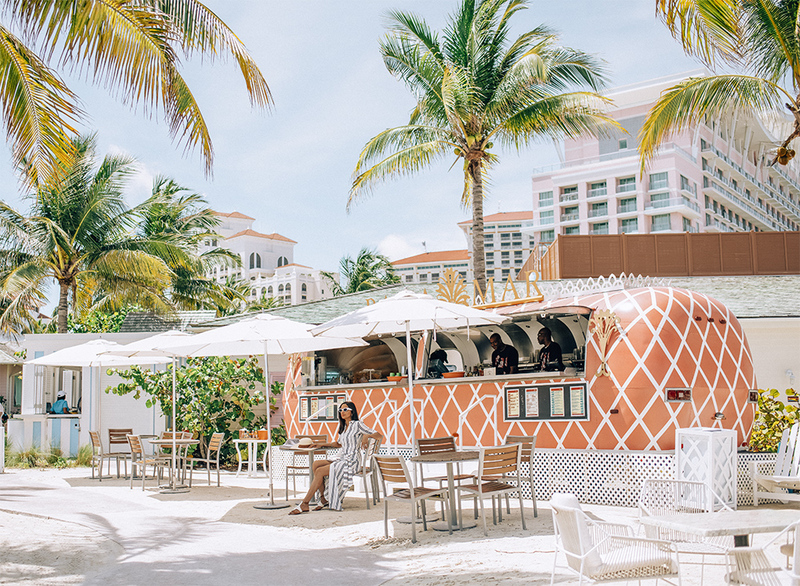 Get hungry while sun bathing on the beach, no fret – the property has multiple food trucks offering a variety of yummy treats ranging from poke bowls to gourmet hot dogs. I frequently stopped by this cute pink food truck because they made the most amazing virgin pina colada. In the evening, we dined at Katsuya, Cleo and Filia. All three restaurants were amazing, but my favorites has to be Katsuya and Cleo. On our last day, we stumbled upon the cutest cafe, Cafe Madeleine, and grabbed some dessert to go so we could indulge in the yummiest chocolate mousse in our deluxe room with a king size bed and the most amazing view of the ocean. Oh and the bathroom (if you can see behind me), talk about Pinterest worthy right! The room is covered in calacatta marble making the space light and airy with a modern touch thanks to the blue and white cabinetry. 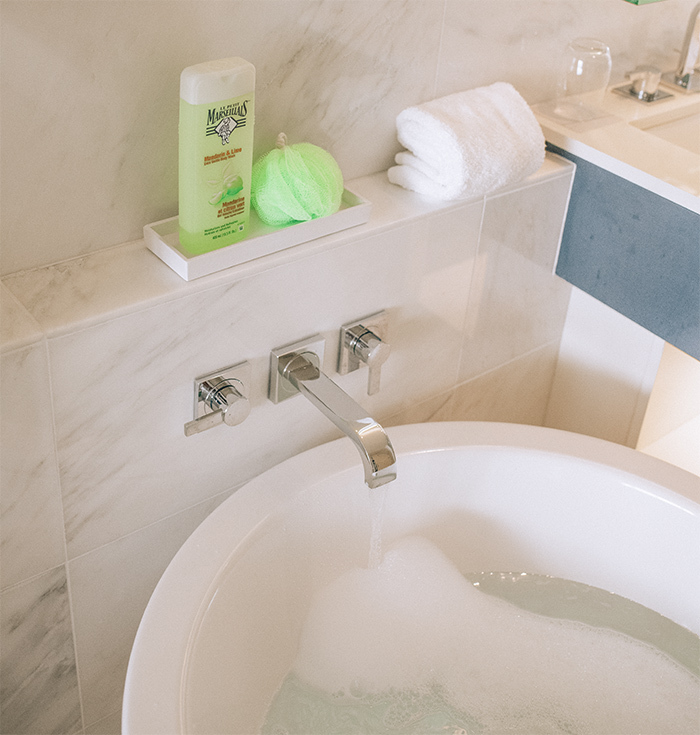 By the way that large tub you see behind me, I made sure to use that every night…and lathered up with my favorite french body wash from Le Petite Marseillais (the manderin and lime is my favorite!). 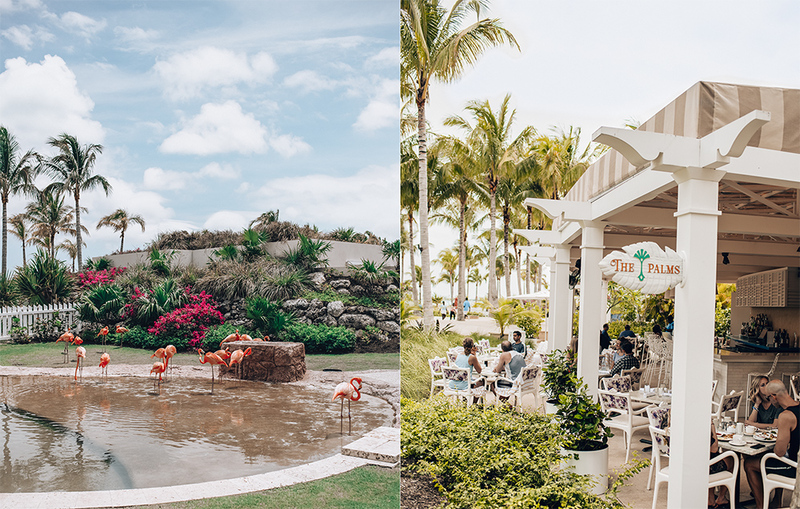 For our last morning, we got a hearty breakfast at The Palm and admired the new flamingo sanctuary (it opened a week before we arrived) before we headed off to The Cover at Atlantis. 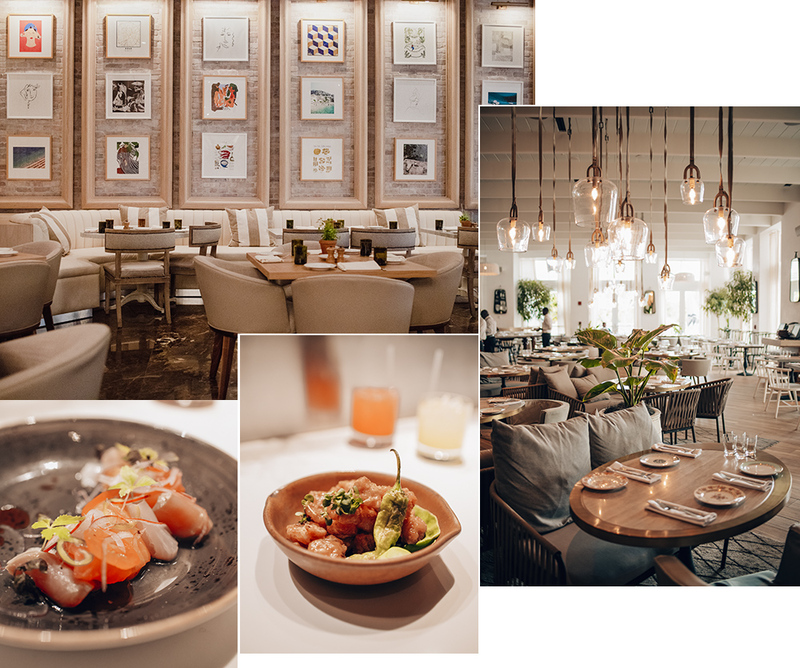 -If you plan on dinning at the resort, there is no need to make any reservations before you arrive. You can plan where you would like to eat when you are there as long as you do it before 1 pm to ensure you get a spot for that night’s dinner. -If you plan on taking any photographs at the resort and you don’t want to see a crowd, head down to the pool or pier at 7am. The lighting is perfect and the pools are empty! -Bring lots of sunscreen! The sunscreen at the resort is pricey and we ran out within four days of staying on the island. -There are many excursions and day trips you can do while staying at either the Grand Hyatt Baha Mar or SLS. I recommend the Exuma Powerboat Adventures for a day trip to Exuma beach where you can frolic with swimming pigs and nurse sharks. We didn’t do this for this trip, but it’s high on my list of things to do on our next trip. -If you forget your toiletries on this trip (shampoo, toothbrush, shaving stick, mouthwash, etc), don’t worry the Grand Hyatt has you covered. Just request it on their console by the bed and you’ll have your complimentary toiletries delivered to your room within minutes. -Planning on bringing kids? That’s great! The property has a small learning center setup for kids and if you want to be adventurous, take them to the aquatic learning area where they can pet turtles and starfish. Literally looks so dreamy babe! wow! Teleport me there now. Thank you so much Ashley! I wanna go back there right now too! I miss the pools, beach and sipping endless amount of mojito’s and pina-colada. Beautiful!!! Love the colors and you! Thank you so much Stephanie! The new editing style is totally inspired by the vacation, I think I’ll keep it around lol. The trip was amazing, by far one of my faves. Oh wow! This resort is on the top part of my bucket list! I’ve seen a bunch of features about The Cove in Atlantis, and this is just amazing! Hi Jess, You should seriously go to the resort, it’s amazing! The staff are super friendly, the food is amazing (food trucks and restaurants), and there is no shortage of pools! Incredible photos! I’m currently writing this comment while the weather outside is cold and gloomy! Really want to take a vacation to The Bahamas now! Great post! Thank you very much Annie! Isn’t the place just dreamy! You should take some time out and go to The Bahamas now! Thank you Kay! The suitcases are gorgeous right!! Love the all the features they included making traveling a breeze! Right girl! The pool is insane and did you know that they have an aquarium on the other side, no jokes! Oh my gosh, I feel for you girl about the suitcase situation. 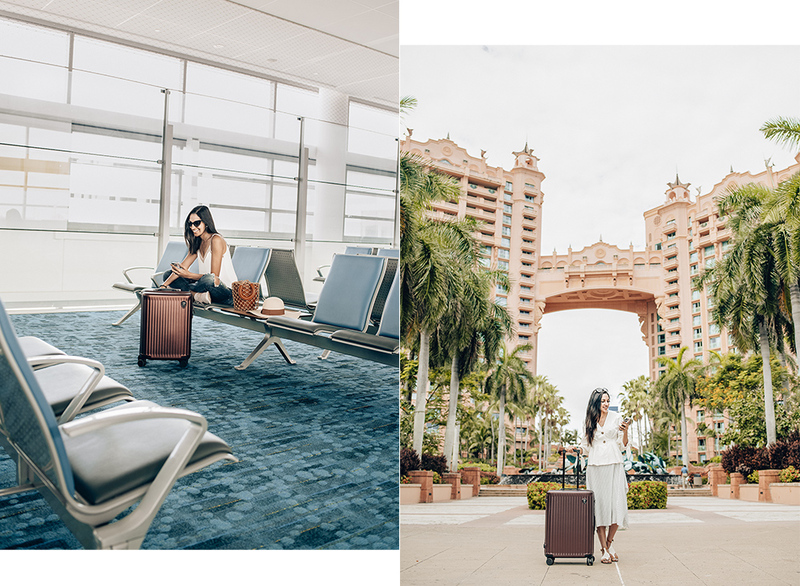 So stressful to repack at the airport, you’ll never get that problem with these suitcases! The Bahamas have been on my bucket list for years. Such a beautiful place and loving your pics! I would be afraid though to go cliffdiving lol. In love with your beautiful pics! Oh my gosh, this travel diary is incredible! I think no matter how beautiful the area a person lives in, the Bahamas would always be a dreamy escape, haha! In particular, the water looks beautiful as does your perfect hotel room. Amazing decor!! oh my gosh, looks so dreamy!! I’m from Toronto and only moved away a couple of years ago, and I absolutely agree with you 100% – I love the food, people and city – there is so much to offer, but the weather gets worse and worse every year… that winter is now 6 months long! This looks like the perfect vacation. All your pictures are amazing! Escaping Toronto for the Bahamas sounds like an EXCELLENT idea. I have always wanted to visit the Bahamas but haven’t yet. Your photos have me wanting to book a trip. They’re absolutely stunning! This literally looks like a dream! !